While we all know that every student is different, things can be more challenging for blind and visually impaired students. Pictures, flashcards, videos and other visual material need to be supplemented for other audio or descriptive materials. Course textbooks will also need to be adapted, fortunately, it is easy to get Braille textbooks, making learning English for the blind more accessible. How do VI learners access learning materials? English for the blind and visually impaired: What is the right environment? We all learn better in certain environments where we feel most comfortable and this is a necessity with any VI learner. 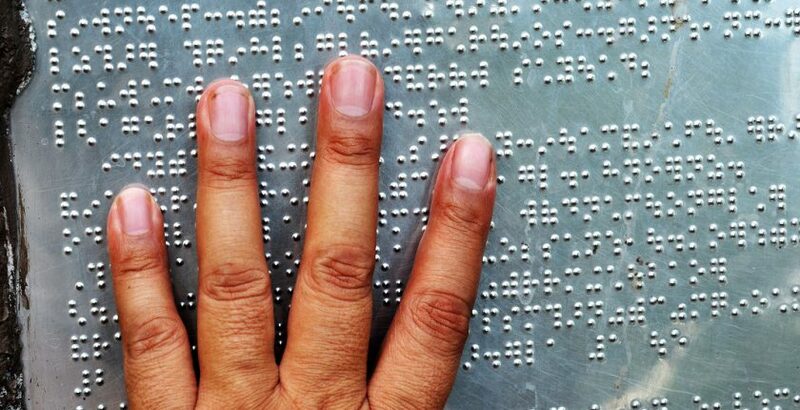 For the blind or visually impaired it affects the learning process as well as the level of access available. A well thought-out environment for VI learners can be beneficial and many issues should be taken in to account. Firstly, the lighting needs to be as natural as possible and evenly-distributed. Secondly, to have a good colour and contrast helps to foster independence in VI learners by helping them to identify places, people and things. Thirdly, for safety reasons, things like furniture, equipment and other fixtures should always be returned to their original place if moved at all so that this doesn’t confuse a VI student who is already familiar with a layout. Finally, to compensate for the lack of sight, good acoustics are essential. Good acoustics should reduce background noise and clarify sounds. How do you include a VI student in a group of students without visual impairments? To provide an active and engaging environment for VI learners, the content needs to reflect the needs of VI learners. Teachers should encourage active participation and put emphasis on communication among students, especially at the beginning, this can help foster a positive environment for VI learners. Additionally, teachers should adapt their planning and presenting as well as changing teaching materials to include the needs of the VI learner. Don’t assume that the needs of VI learners are all the same. The best route to successful teaching is to try and understand how much sight is remaining, if any, and to try and make use of it if possible. Don’t think that all VI learners use Braille, even when they do, they may prefer alternative methods of instruction. Always ask VI students about what materials they would like to use and if adapting materials, always ask their preferences. Always try to adapt parts of the curriculum that might prove difficult for VI learners, instead of just removing them. Where possible, try to use real objects when introducing vocabulary, you will be surprised how this helps fully-sighted students too. A VI student is first and foremost a student like any other learner with differing needs and learning preferences. The key word to help a VI student learn English is: adaptation. Adapt your approach, adapt your materials and adapt your attitude of what you think a VI student is. The best way to adapt is simply to communicate with the VI learner and ask what their learning requirements are.